As urban areas sprawl, green spaces, bare ground and wetlands get replaced by grey infrastructure—paved surfaces, concrete roads and buildings that do not allow water to percolate. As a result, cities and towns get flooded even by a marginally heavy rainfall. The problem is getting aggravated in recent years as a major chunk of the annual rain now pours down just within a few hours due to changing climate. On the Independence Day last year, Bengaluru woke up to a flooded city after it received 129 millimetres of rainfall in less than three hours. This was the heaviest downpour in 127 years. In 2015, the entire city of Chennai remained submerged under water for a few days after the city received record rain. Though the heavy rainfall has been attributed to El Nino events, Down To Earth’s analysis has over and again established that the unprecedented flooding was the result of shrinking lakes and built-up stormwater drains and water bodies. The situation is no different for Noida, a satellite city of Delhi located on the floodplains of the Yamuna. Over the decades, built-up area of the city has expanded at the cost of agricultural land and wetlands owing to real estate boom. Small wonder, Noida has experienced several instances of heavy floods in the past 30 years. Though the region on an average receives 90-120 mm of rainfall in an hour, estimates show that just 18.85 mm/hour of rainfall can cause flash flood in the city. Can this excess rain be channelised to percolate and replenish the city’s groundwater which is fast depleting? With this dual problem, the Noida Authority approached researchers of the Centre for Science and Environment (CSE) in Delhi, who have prepared a cost-effective and land-use-specific plan for the city. The researchers say the plan can also be replicated in other cities. The problem stems from the fact that existing policies on stormwater management treat stormwater as a “liability” rather than a “resource”, says Suresh Rohilla, progra mme director of the water management unit of CSE. The need of the hour is to change current practices from flood engineering to flood management. Several studies have highlighted the importance of harvesting stormwater run-off to address the widening gap between water demand and supply, and climate change-related uncertainties in urban areas, Rohilla adds. Rohilla and his researchers began their study using data and maps related to water scenario, land use and climatic conditions of the city. The availability of space and run-off, depth of the water table and lithology (study of subterranean rocks) of the area were noted using state-of-the-art techniques, such as remote sensing and Geographical Information System. Analysis of these parameters shows that Noida has a high run-off availability. Two major water sources can be harvested during the monsoon: floodwater of the Yamuna and rainfall run-off. Noida’s rainwater harvesting potential is 27.73 million cubic metres (MCM). This is sufficient to meet 26.63 per cent of the sprawling city’s annual water demand. An additional 5 MCM of unused Yamuna floodwater can also be harvested. CSE researchers thus propose to harvest the entire 32.73 MCM of floodwater and run-off following the principles of water sensitive urban design and planning (WSUDP)—an engineering approach that integrates urban water cycle, including stormwater, groundwater and wastewater management and water supply, into urban design. “It is easy to apply the principles of WSUDP in undeveloped areas but is equally feasible in existing developed areas through some innovative and imaginative thought,” says Manu Bhatnagar, principal director of the Indian National Trust for Art and Cultural Heritage (INTACH) in New Delhi. Common WSUDP structures include filter strips, swales, rain gardens, filter drains, detention basins, infiltration basins and porous pavements. Swales, for instance, are low-lying depressions, usually on the sides of roads, designed to manage water run-off, filter pollutants and increase rainwater infiltration. A rain garden is a small depression on a slope where local shrubs and flowering planted can be grown. It is designed to temporarily hold and soak in rainwater runoff that flows from roofs, driveways or lawns. CSE researchers have found that WSUDP structures can be implemented across open spaces on government-owned land in Noida. 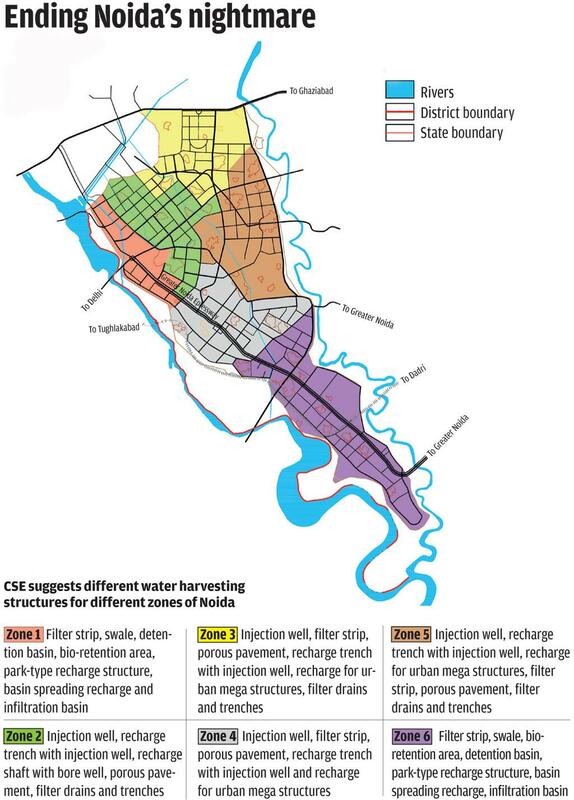 Using the division of the city into six zones based on the soil and water level, the team has suggested which WSUDP structure would be suitable for which zone (see ‘Ending Noida’s nightmare’). The team says Noida can also learn from its global counterparts. For example, the Netherlands is dotted with seaside parking garages and city plazas that double as storage ponds during floods. “From individual houses to apartments and gated communities, all can become part of the solution through WSUDP,” says S Vishwanath, rainwater harvesting expert at Biome, an environmental organisation in Bengaluru. The Noida Authority is satisfied. “We will implement CSE’S proposal in our parks and green spaces soon,” says Omveer Singh, Director, Horticulture Department of the Noida Authority.